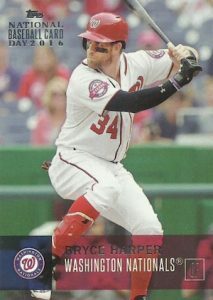 Taking a page from Upper Deck and their day of celebration for hockey collectors, 2016 Topps National Baseball Card Day reestablishes the MLB promo for collectors that looks to be a new annual event in the making. The limited NBCD packs will be available at select hobby shops on Saturday, August 13. While the special collecting day was first mentioned at the Industry Summit in Hawaii, the official reveal for 2016 Topps National Baseball Card Day came at the 2016 National in Atlantic City. 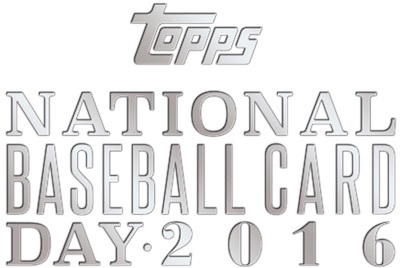 Packs contain six cards and each card showcases the National Baseball Card Day logo. Although the 49-card base offering features Kris Bryant in the final spot, Bryant is only available as a gift with purchase and not found in the standard packs. There will also be limited signed versions for 14 players from the base set. Every collector will receive one free pack and the promotion extends to card shops in both the United States and Canada. Collectors can obtain the special Kris Bryant card (plus an Ultra Pro One-Touch case) with a $10+ purchase. 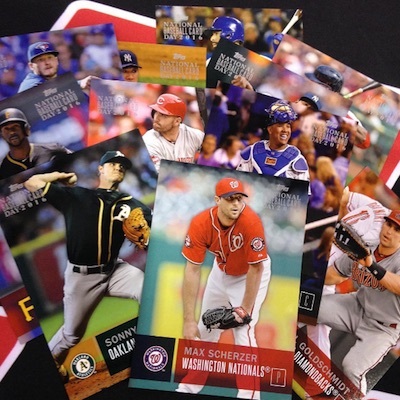 Hobby stores are not the only place to find 2016 Topps National Baseball Card Day as packs will also be handed out by various MLB players at select ballparks on Friday, August 12. 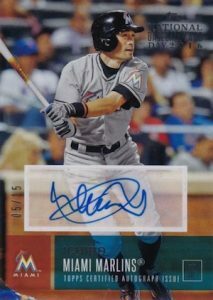 Topps also released a digital version via Bunt. While this marks a new run for the free cards from Topps, this is not a new concept for baseball card collectors. Topps previously participated in a NBCD promo with Upper Deck that last took place in 2008. 49 cards. Card #23 was not included on the checklist. *Kris Bryant is not found in regular packs. 14 cards. Serial numbered. Known print runs shown below.